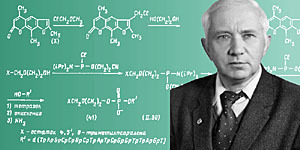 Academician Dmitry Georgiyevich Knorre is an expert in the field of chemical kinetics, molecular biology, and bioorganic chemistry. He is academician of RAS, the winner of the Lenin premium, the premium of the Council of ministers of the USSR and the M.M.Shemyakin's premium of the Academy of sciences of the USSR, honoured Soros professor. Knorre, Dmitry Georgiyevich, was born on July, 28th, 1926 in Leningrad. He has graduated from Moscow institute of chemistry and technology (1947). Doctor of Chemistry (1967). Full professor (1969). Academician of the AS USSR (1981). Academician of the Russian Academy of Natural Sciences. An expert in the field of biological chemistry. Post-graduate student of Moscow institute of chemical physics (1947-1951). The junior research assistant (1951), senior research assistant (1956), the Head of the laboratory of chemistry of nucleinic acids (1960-1984) of the Novosibirsk institute of organic chemistry of SB AS USSR. Director of the Novosibirsk institute of bioorganic chemistry of SB RAS (1984-1996). The basic directions of the scientific activity: studying the kinetics and the mechanism of complex chemical reactions, the development of methods of the directed (affine) chemical modification of biopolymers and their applications to study the components of the system for biosynthesis of proteins. The assistant (1953), the senior lecturer of the Moscow physicotechnical institute (1961), the professor (1969), the dean (1967-1983) of Novosibirsk state university. The member of editorial boards of the following magazines "Molecular biology", "Bioorganic chemistry" and "FEBS Letters". The scientific supervisor of studies on the target modification of nucleinic acids that are included into the section of the State scientific and technical program "The newest methods of biotechnology". Academician-secretary of the Branch of biochemistry, biophysics, and chemistry of physiologically active compounds of RAS. As of now, he is the adviser of RAS. Last years, Knorre D.G. is engaged in the research in the field of theoretical bases of the complementary-target modification; in the development of new approaches in studying phototransformations of derivatives of oligonucleotides in the duplexes that are made up of complementary oligonucleotides that bear photoactive groups and residues that model lateral radicals of amino acids; in the study of photoaffine modification of permolecular structures. During the greater part of his activity, he combines research and pedagogical work. Academician Knorre has created a powerful scientific school. Together with his disciples, he has contributed much to methods of synthesis of oligonucleotides, he has created a wide spectrum of their reactive derivatives for the directed modification of nucleinic acids. Academician M.Grachev, S.Netesov, corresponding member of RAS, have passed their formative stage in the scientific school of D. Knorre. V.Vlasov, the full member of RAS, the disciple of academician Knorre, supervises now over the Institute of chemical biology and fundamental medicine. The department of biological chemistry of NIOCh, and later NIBCh SB RAS, were a forge shop for highly skilled staff for many years. Dmitry Georgiyevich has imparted love and fidelity to science to many collaborators of the Institute of chemical biology and fundamental medicine. Now they continue successfully develop the directions he has begun; they create new directions and conduct the research in hot spots of the modern science. * Sources: 1) Knorrye Dmitrii Gyeorgiyevich // Myelua A.I. Rossiiskaya Akadyemiya yestyestvyennykh nauk: EHntsiklopyediya / pod ryed. Kuznyetsova O.L. - M.; SPb. : Izd-vo "Gumanistika", 1998. - C.263. 2) Alyeksandrova YUliya. Vyechnoi dorogoi otkrytii // Nauka v Sibiri. - 2006. - Iyul' (N 28-29). - S.3. Dokumyent izmyenyen: Wed Feb 27 14:46:34 2019. Razmyer: 9,683 bytes.